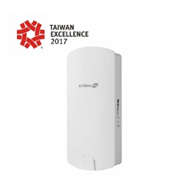 NEW DELHI, India – March 23, 2017-Edimax Technology, a leading provider of premier networking solutions bagged three Taiwan Excellence Awards for its range of new and innovative products: Edimax OAP900 enterprise-class outdoor access point, Edimax AirBox air-quality monitoring system and Edimax IC-6220DC– a smart-home peephole door camera. Along with this, Edimax experienced a great year as a networking solution provider – celebrating its 30th Anniversary and a move into a brand-new Taipei headquarters thus stepping up the gas on its growth pedestal. An internationally recognized mark of excellence, quality and trust, Taiwan Excellence Awards are given to world-class, revolutionary products which embody innovation and value by the Taiwan External Trade Development Council (TAITRA) every year since 1992.Award-winning products at Taiwan Excellence Awards 2017 display a logo which features interwoven arcs to represent the solidarity between Taiwanese manufacturers in a pursuit of excellence, and the links between Taiwan and the fast-moving global economy. “We are overwhelmed to receive this prestigious Taiwan Excellence award 2017 for our three new and innovative product categories. Presently, these products are the leading edge technology at Edimax which features unsurpassed design and prodigious innovation“ said Sanjay Joshi, Country Manager at Edimax Technology.“Edimax Pro range ensures efficient latest networking technology and best-in-class solutions for partners and customers at most affordable prices” – summed Mr Sanjay Joshi. The three Edimax products to receive the award are the Edimax OAP900, an industrial-grade build quality along with a range of powerful features means it can offer tremendous value for businesses and ISPs. With an IP65-rated waterproof housing and high-speed 802.11ac Wi-Fi, the outdoor access point is flexible for multi-tenant environs – or for last-mile ISP bandwidth solutions. The second winner is Edimax AirBox which is a real innovation that accurately measures harmful PM2.5 levels in the air, along with humidity and temperature. 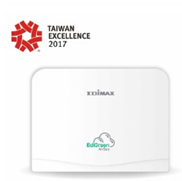 Developed in partnership with Academia Sinica, Airboxes connect to Edimax’s Cloud Platform to provide hyper-local data as well real-time big data from the wider network of Air Boxes that have been deployed across Taiwan and other countries around the world. There’s Google Maps integration and additional APIs for third-party analysis and software development. The final winner is the Edimax IC-6220DC; the Peephole Camera is the only product of its kind – replacing doors’ old- fashioned peephole with an advanced Wi-Fi camera – while preserving the original peephole so it can still be used. With a passive infrared sensor (PIR) motion-detection system, night vision, two-way audio and mobile notifications, the unique product offers safety, convenience and peace-of-mind to any home, with hassle-free DIY installation and easy storage options with Google Drive or Dropbox.